Almost two years following 2016’s magnificent ‘Stranger to Stranger,’ Paul Simon announced he was retiring from the road before embarking on the appropriately named “Homeward Bound – the Farewell Tour.” Simon’s thoughts may have been on the past when he stepped in the studio to work on what would become his 14th studio album, ‘In the Blue Light,’ but he has found a way to reimagine that past without leaning on nostalgia; by taking apart and reworking both lesser-known and overlooked deep cuts from every stage of his solo career. 1973’s classic ‘There Goes Rhymin’ Simon’ is represented by the lead-off track, a groovier, bluesier take on “One Man’s Ceiling is Another Man’s Floor.” Joel Wenhardt’s piano echoes legendary Swamper Barry Beckett’s keys in the Muscle Shoals Rhythm Section treatment of the original. Wife Edie Brickell contributes finger snaps to the updated version, and Simon’s vocals, like much of the album, sound wiser with age, adding gravitas to this deceptively mundane tale of city dwelling. The musicians on ‘Blue Light’ are, per usual, without equal. From Wynton Marsalis contributing transcendental muted trumpet on both a beautiful take on the ‘One Trick Pony’ standout, ‘How the Heart Approaches What It Yearns’ and a brilliant New Orleans/Dixieland-inspired ‘Pigs, Sheep and Wolves’ from ‘You’re the One’ to both Jazz guitar great Bill Frisell and the legendary Steve Gadd behind the kit on two more ‘You’re the One’ tracks, ‘Love’ and the heartbreaking ‘Darling Lorraine.’ (Interestingly, ‘You’re the One’ is represented by 4 of the 11 songs here, shining new light on this overlooked gem from 2000.) New York-based chamber ensemble sextet yMusic contribute to both ‘Can’t Run But’ – originally found on ‘Rhythm of the Saints’ – and ‘Rene and Georgette Magritte With Their Dog After the War’ from his underrated masterpiece, ‘Hearts and Bones.’ While the former suffers from the lack of the driving rhythm and percussion of the ‘Saints’ version (the string-heavy arrangement is interesting but not as successful), the latter is given more depth due possibly to its timely – and unfortunately, timeless – subject matter. 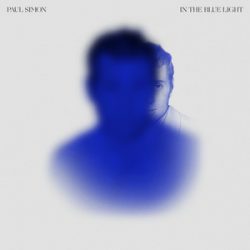 If ‘In the Blue Light’ is meant as a coda to the career of one of the greatest songwriters of the rock era, it is truly a unique and rewarding way to celebrate as well as rediscover Paul Simon’s peerless catalogue through a fresh perspective.